The band from Los Angeles was founded by singer / guitarist Patrick Kennison and Marty O'Brien (We Are the Fallen, Disturbed (touring member)). As usual the band has been through some line-up changes. The California rockers kick off with Dying Vicariously, a catchy guitar-based rock tune with fast passages and a dash of anger. When Daylight Dies was produced by Grammy-awarded guitarist Ben Moody (ex-Evanescence). The songs begins with slowly with acoustic guitar, but then they go full force into an emotional rocker. At Heartbreaker they remind me of some late 80's glam metal band... But they combine the 80's elements with modern rock and heavy guitars. With acoustic guitar they head into King Of Nothing. Like before the song gets heavier, but they return to the opening theme. So, even if it might sound like they repeat themselves, stick to a scheme, it's not true. A wild but melodic rock song is Hollywood which seems to cite Madonna's Hollywood for a brief moment. Don't expect a pop rock tune! The closer is Above The Satellites, the rocker has a melancholy edge - but again it's the vocals which will hook you up. 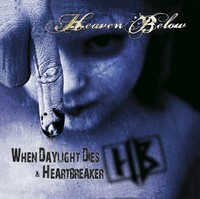 Heaven Below is offering emotional rockers which show influences from different hard rock / metal acts, but they create their own sound. Especially the expressive vocals of Patrick Kennison make them stick out. Fans of bands like Disturbed, 3 Doors Down, Three Days Grace as well as fans of hard rock who aren't afraid of some modern sounds should check out Heaven Below!